At Clear Lake Chrysler Dodge Jeep Ram, our highly qualified technicians are here to provide exceptional service in a timely manner. From oil changes to transmission replacements, we are dedicated to maintaining top-tier customer service. Allow our staff to demonstrate our commitment to excellence. See what our customers have to say about their experience at Clear Lake Chrysler Dodge Jeep Ram. Welcome to our new and improved website! Clear Lake Chrysler Dodge Jeep Ram has been serving the Houston car purchasing community for over 30 years. Our sales staff is handpicked and groomed to give you, the customer, a fantastic buying experience. Our service department is driven to keeping you a “Satisfied Customer for Life.” If you are unable to find the vehicle that best suits your needs, please do not hesitate to contact us immediately. We can usually find that special vehicle within 24 hours. Our contact information and a map to the dealership is located just to the right of this tab. We look forward to welcoming you to the Clear Lake Chrysler Dodge Jeep Ram Family. We proudly serve the following areas: Alvin, Bacliff, Baytown, Clear Lake, Deer Park, Dickinson, Friendswood, Harris County, Houston, Kemah, La Porte, League City, Pasadena, Pearland, Sugar Land, Texas City, and beyond! 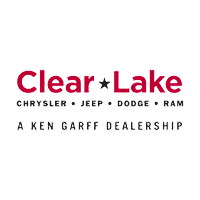 Clear Lake Chrysler Dodge Jeep RAM is the place to go if you are in search of a new or used vehicle. We feature a complete lineup of new Dodge, Chrysler, Jeeps, and RAM trucks, including the popular Pacifica, Journey, Cherokee, Grand Cherokee, Wrangler, RAM 1500, and more! View our new inventory right on our website. We also offer our customers an amazing selection of used cars, including certified pre-owned models, as well as used cars, trucks, and SUVs from various other automakers. View our used inventory, then give us a call to schedule a test drive. If you have any questions or concerns about your credit situation, fill out our secure credit application and our finance team with reach out to try to help you secure the loan you need. Even if you have poor credit or no credit, we’ll do our best to help you! If you need car repair, parts, or maintenance and live in the Webster area, Clear Lake has a team of qualified service technicians who are standing by to get your vehicle in the shop and back on the road in no time. From a simple oil change to tire service, brake repair, and more, our certified technicians are here to help. You can schedule your appointment right on our website. We proudly service the following areas: League City, Pearland, Pasadena, and more.